David Malpass, US President Donald Trump's nominee to lead the World Bank, won unanimous approval from the institution's executive board. 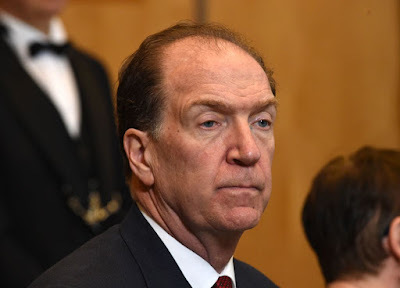 The bank said that Malpass, the US Treasury's undersecretary for international affairs, will start his new role on April 9th 2019. Malpass, a former Bear Stearns and Co chief economist who advised Trump's 2016 election campaign, was the sole candidate. Malpass said he would uphold the bank's commitment to reducing poverty in the poorest countries and to fight climate change, and pursue goals stated in a $13 billion capital increase last year. Malpass emphasized the need to fight extreme poverty and "foster broad based growth for each and every borrower, and a stronger, more stable global economy for all." Malpass in the past, had been critical of the World Bank's continued lending to China, arguing that the world's second-largest economy was too wealthy for such aid while it was loading up some countries with unsustainable debt from its Belt and Road infrastructure program. Malpass intends to make his first trip as World Bank president in late April to Africa. Q. Who has been named as the President of World Bank?